September? Already? Are you sure? Even though I feel as though this summer went by extremely fast (actually, all of the seasons feel that way to me), I have some wonderful memories of places that my family went and the fun that we had out playing in the sunshine, grass and water. There are more. Lots more. 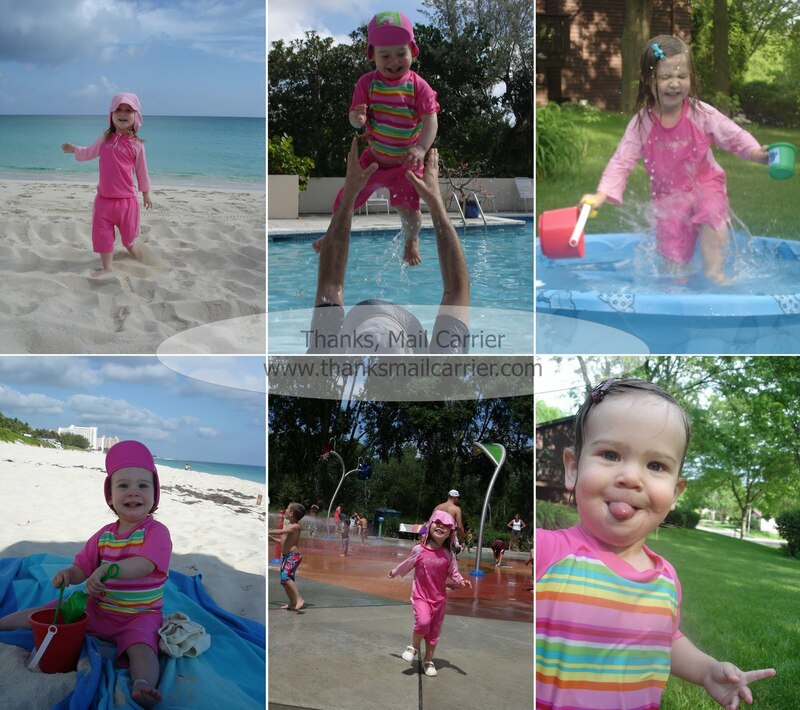 We went on vacation to the beach in the Caribbean, we swam in the pool, we played at the splash park and in the yard... and, in just about every picture, I can look back and see my smiling, happy girls wearing their amazing Two-Piece Two Tone Sunsuit and Two-Piece Stripe Sunsuit from i play., Inc. I don't take any chances when it comes to my daughters and being out in the sun. Big Sister E has extremely pale skin and, even though hers isn't quite as light, Little Sister B's complexion is far from something I would call dark, too. We've used traditional swimsuits in the past and the amount of time spent listening to whining as I applied sunscreen to every exposed inch was never pleasant. And that wasn't the end of it. Having to reapply, constantly check for red shoulders and in general worry about what harmful effects the sun was having on my kids just wasn't how I wanted to spend my time outdoors. These sunsuits, however, are the perfect solution. 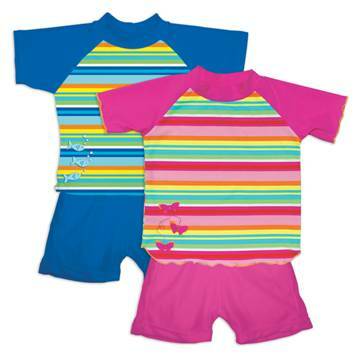 The Nylon/Lycra combination of these sunsuits makes them stretchy and comfortable, not to mention strong and durable enough to withstand use after use. I LOVE that they are two pieces, making getting dressed and undressed (and trips to the bathroom) extremely easy, especially compared to one-piece girls' swimsuits. The bottoms of both sunsuits have an Ultimate Swim Diaper built right in, which is fantastic for children still in diapers. I couldn't be happier with the super absorbent inner layer and wick-away lining right there in the shorts and saving myself the hassle or money of buying separate swim diapers. And even though Big Sister E hasn't worn a diaper for ages, she likes having the added layer to keep her from feeling too exposed in just a pair of shorts. Then there is the protection. 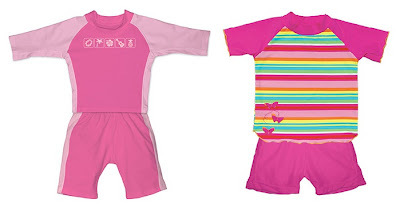 I am familiar with SPF (Sun Protection Factor) ratings, of course, but when I learned that the Two-Piece Two Tone Sunsuit and the Two-Piece Stripe Sunsuit are UPF (Ultraviolet Protection Factor) 50+, I wanted to find out more. After doing some research, I found that a fabric with a UPF rating of 50 will allow only 1/50th of the sun's UV radiation to pass through it. In short, this means that by wearing these sunsuits, the fabric is reducing my daughters' UV radiation exposure by 50 times. 50! Considering the Two Tone suit has sleeves past the elbows and shin-length pants, Big Sister E's extra-fair complexion safely stayed that way all summer long. But i play. doesn't stop at sunsuits when it comes to protection from the rays. 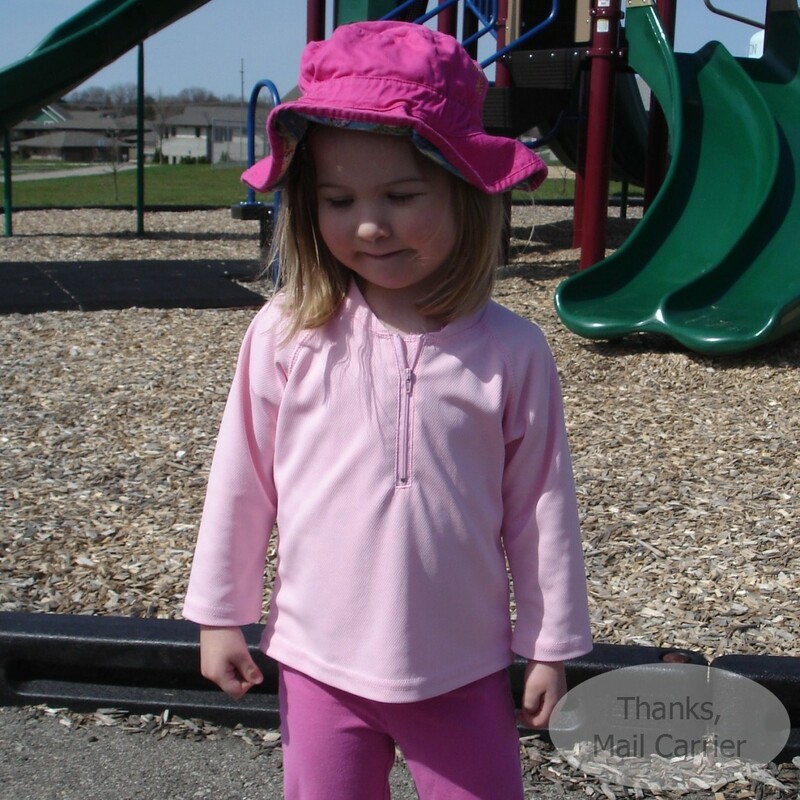 The Solid Flap Sun Protection Hat that Big Sister E is wearing in many of her pictures was a great way to keep her head, face and neck as safely covered as the rest of her. 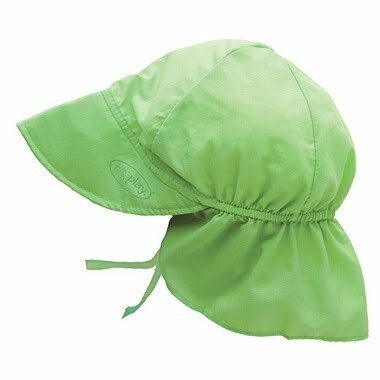 With its water resistant UPF 50+ fabric, baseball cap brim and long, wide neck flap, there was no way the sun was going to peek through. For the days that we weren't around water, i play. extended Big Sister E's ability to have great sun protection with a Breatheasy Sun Protection Shirt. 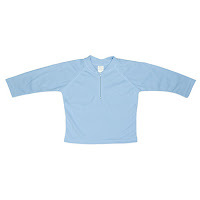 Soft and light, this shirt easily slipped on an off over her head and, keeping the sun away and letting the air through, she was able to stay cool and relaxed while beating the heat. This summer would not have been the same without i play., Inc. Given the choice, Big Sister E strongly favored her "shorts swimsuit" every single time and Little Sister B had no complaints either. 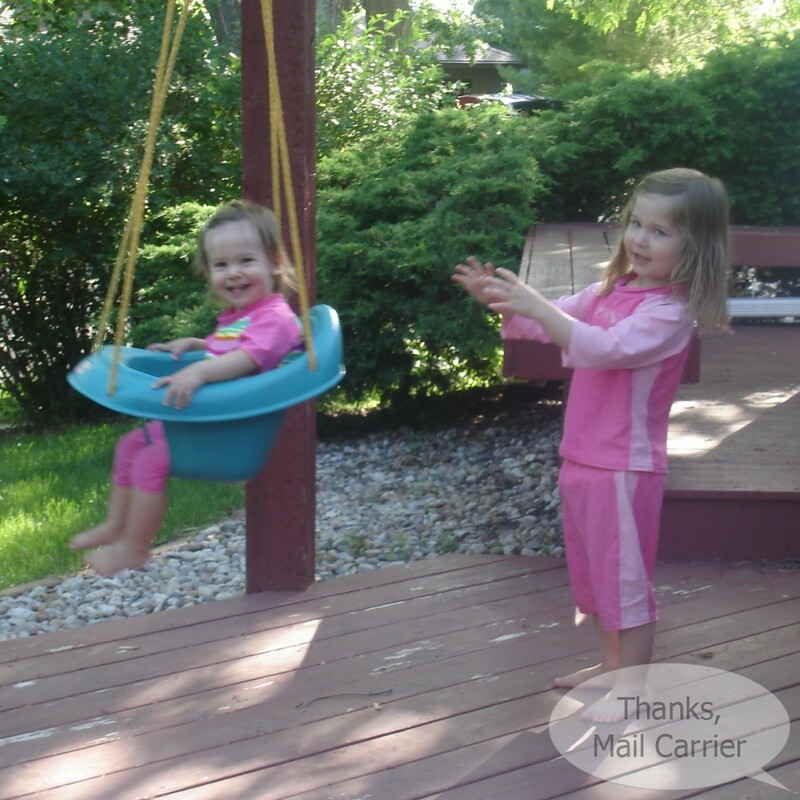 Both girls were comfortable and happy and we received multiple comments from other moms on how impressed they were with the idea of a great sunsuit, sunhat or sun protection shirt for their own child. Based on values that prioritize protecting our earth and our children, i play. offers fun, healthy and safe products of all kinds that you and your kids are sure to love. 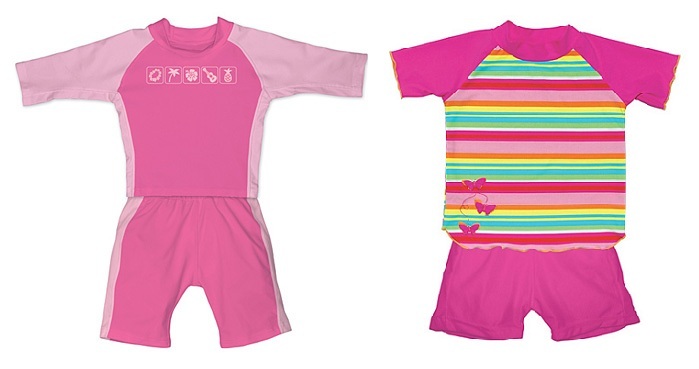 From adorable layette to sweet little rain boots to fun water socks and shoes, i play. 's high quality and affordable prices will keep you coming back for more. Available online or in retail stores across the country and worldwide, you can easily find these amazing products throughout the internet or check them out in person at your favorite nearby store. from i play.! ARV $26.99! Winner will have their choice of boy or girl version as well as size. To enter to win: Visit i play. and tell me another of their amazing products that you would like to own. 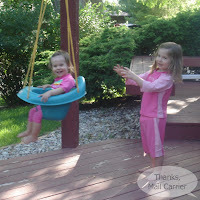 3 Extra Entries if you blog about this giveaway linking back to Thanks, Mail Carrier and i play. Please leave an address where it can be found. A huge thank you to i play. 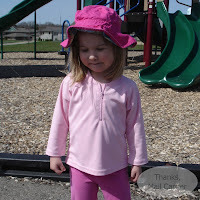 for providing two sunsuits, a sunhat and a sun protection shirt for review as well as a sunsuit for one lucky giveaway winner. The opinions shared are my own and honest and if you really need to see more, click here to see how I roll. I LOVE the lavendar hawaiian swim diaper suit! I like the Itsy Bitsy Mama/Baby Yoga Mat! I love iPlay. Just bought my nephew a pair of swimtrunks. I would love the Origins EcoFleece Reversible Earwarmer Hat in toddler size! i love their no spill sippy cup! entered the double duty divas! Another product I like is the Lavender Calypso Ultimate Ruffle Swim Diaper. I love their Fun Prints Ultimate Swim Diapers! Like I Play on Facebook! Follow i Play on Twitter! Promoted on Facebook & tagged both Thanks, Mail Carrier and i Play Inc so it shows up on both walls! I like the Seal Splash Toy! I subscribe to the iPlay newsletter! I entered the Snack and Play giveaway! I entered the Amazon GiftZip giveaway! I would like to own their Heavy Duty Rainboots! I like their cute Fleece Ear Warmer Hats! I signed up for i play's newsletter. I entered your Baby Pop giveaway. I also love love love their swim diapers...I can't say enough good stuff about them! I like the Soft & Snuggly Earwarmer Hat. Signed up for i play newsletter. Follow i play via twitter. The Fun Fleece Reversible Vest is cute!